​Dr. 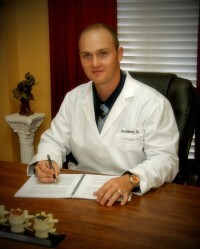 Ross Ramsey is a board certified Chiropractor and a graduate of the Texas Chiropractic College. Since becoming a chiropractor he has served this community by caring for infants, children, teens, adults and seniors. He is passionate about assisting people to take control of their health through natural health care. Throughout his career, he has researched extensively to discover what it takes to get sick people well naturally without the use of drugs and surgery. Recently, Dr. Ramsey was certified as a Medical Examiner and is now offering those services at the clinic. Dr. Ramsey is a member of the Chiropractic Association of Louisiana, the Oakdale Chamber of Commerce, and the Oakdale Lions Club. He volunteers his time by providing Scoliosis screenings for students in the Allen parish area.